Note: I know this list is completely subjective (and don’t get me wrong, I love Mr. Burns) but don’t you think C. Montgomery is a bit high on this list? One power plant does not a financial empire make. 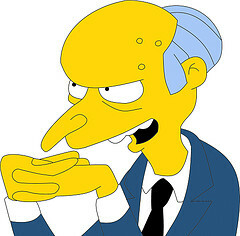 Are we to understand that Mr. Burns runs a full-fledged energy company? We’ve heard bits and pieces over the years that he might have diversified into other businesses, but from what I remember, the power plant is his core- if not his only- holding. I mean, clearly Bruce Wayne, Daddy Warbucks and others in the defense industry would have benefited since 9/11. And in this era of high oil and commodity prices, Jed Clampett and even Scrooge McDuck would be doing quite well (though Mr. Monopoly’s net worth must have taken a hit this year). But would Mr. Burns really be number 2 just on the back of a power company?